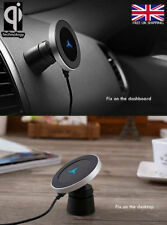 Your phone can stand on the base, convenient and beautiful and practically. Due to the difference between different monitors, the picture may not reflect the actual color of the item. Color: Black. 100%New & High Quality. IPHONE 6 6S 6PLUS 6S PLUS. 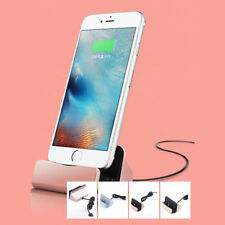 The iPhone dock is simple to use, simply plug the USB cable into your computer and away you go. Not many docking stations allow you to keep your phone in it's case. This dock is compatible with ultra slim cases including almost all Silicone, Gel, and hard cases. •Apple iPhone 6,Apple iPhone 6. •Makes a great bedside alarm clock. •Small and portable design. We'll be more than happy to satisfy you. The images are for Illustration Purpose only, product may vary in the code or date of manufacture. Never used, and wrapped with cling film to avoid scratches. The condition is New. • One micro USB cable. • Transmission distance: <8mm. • Low temperature - High efficient driver design. 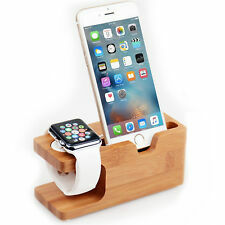 This station is a perfect combination of an Apple Watch charging stand, also a desktop stand for ALL iPhone and other smartphones. For Apple Watch 38/42mm & iPhone. ARE YOU LOOKING FOR APPLE WATCH BAND STRAP TOO?. For Apple Airpod's Dock. Item Type: Dock. for Apple iPhone SE/ 6S Plus/ 6S/ 6 Plus/ 6/ 5S/ 5C/ 5/7/7 Plus/8 8plus/X. Your phone can stand on the base, convenient and beautiful and practically. Use your original Lightning cable attached to the base to work. 1 X iPhone 3 Docking Station. Suitable for all iPhone 3's. Once you have received your item we are on hand to help in any way that we can. Very high quality and beautiful design. so it's ideal for a desk or worktop. Say goodbye to tangled wires, losing charging cables, and slow wireless charging speed. 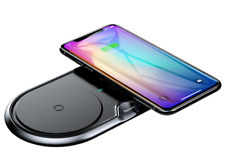 |Compatible with any device with Qi standard like Samsung Galaxy Note 8/S8/S8 Plus/for Galaxy S7 / S7 Edge,for Samsung Galaxy S6 Edge Plus / Galaxy S6 Edge / Galaxy S6 AND for Samsung Note 5. New Portable iphone 5s,5c,6, 6 Plus desktop charger And Data Sync.